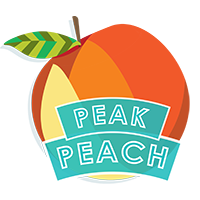 Nate’s favorite Peak Peach recipe is simple: ice cream with a burst of fresh peach flavor! Scoop ice cream into blender; alternate between pulse blending and chopping chunks with a table knife to assist with mixing and blending. Keep pulse blending to a minimum so ice cream remains slightly chunky. Add cream or milk sparingly. Toss in peach slices, using pulse blending just enough to create tiny bits of peach mixed throughout. Serve immediately in glass tumblers. Yum!